Kala Pocket Ukuleles starting to appear in the wild! I've been waiting for the Kala Pocket Ukulele to make its appearance "in the wild", so to speak, for a few weeks now. If you recall, Kala sent me the Acacia model to test and review and I freaking love it. It's adorable, beautifully made and it sounds fantastic! But, I've been getting a lot of questions like "Where can I get one? ", "How much will they cost?" and so on. I had originally heard that list on the Mahogany was going to be around $299 and list on the Acacia was $399. Yup, don't let the size fool you. These are beautiful, high quality instruments... they just happen to be teenie tiny. Easy Music Center's "Wall of Ukuleles"
But, for those of you who just can't wait, I have seen a few of these beauties popping up on eBay. So, here's what's currently out there right now. Good luck! Posted on April 14, 2010 September 30, 2016 Categories Ukulele Deals, Ukulele NewsTags easy music center, kala, kala pocket uke, kala pocket ukulele, kala ukulele, pocket uke, pocket ukuleleLeave a comment on Kala Pocket Ukuleles starting to appear in the wild! So, today I felt like I needed to do something special for my wife, Erika. I stayed up super late playing poker and maybe drinking too many beers and I slept in too late, etc. She's the center of my world and I knew I needed to remind her of that today. So, what did I do? Well, I covered some Magnetic Fields, of course! Maybe this doesn't make sense to everyone, but Magnetic Fields are pretty much a touchstone for us. Hell, our youngest son's middle name is Merritt for heaven's sake. We're pretty rabid fans. But, this song is something special for us. A fantastic Missoula band, The Oblio Joes, played on our wedding day and they played this song as "our song". I actually sang it with them (although, I guess I probably should have been dancing with Erika, right?) and it sealed this song in time, as ours. Then several years later, The Oblio Joes played their last show ever in Caras Park in Missoula. Well, this last show took place on the anniversary of our wedding. So, as a surprise to Erika, I jumped up on stage and sand Strange Powers with the Obes for the last time. Oh yeah, and I recorded it on my MOTU Traveller interface. I love it! And I used an AKG C 2000B Microphone. But, enough of all that tech jibber jabber. This one is for my baby. I hope you like it, Erika. P.P.S. I'd love to make a video for this song. You know one of those rad videos that shows me playing each of the instruments as the part comes in for the first time. But, that seems like a ton of work and I'm not really sure what software to use. Does everyone do those with Adobe Premier? It seems like it has a steep learning curve (and costs about a million dollars). Any other suggestions? P.P.P.S Crap. I just realized that I muffed the lyrics in a few spots. Hopefully Stephen Merritt never hears this because I'm not sure I could stand up to his sardonic comments and cool stare. I finally got a few free minutes during lunch to make a video showing off the Kala pocket ukulele. I think that the powers that be must have known I only had a few minutes, though because they kept effing with me. I'd play the song perfectly and the cat would run by and mess it up. Or, the shot was great and my brain turned off. It seemed like it was something every time, so finally, I just decided that I was going to do one more and that was it. Of course my freaking knee was covering the pocket uke the whole time though. Doh! Next time I'll be more careful to let you see the uke while I'm playing it. Anyway, this song is one of my favorites to play (even if I can't always remember all the words) and my son Simon really loves it as well. He usually sings the chorus with me if he's anywhere near while I play it. So, that's pretty fun. He and I have a Ramones cover band also, (we're called "Second Verse, Same as the First") so maybe I can convince him to make some videos with me of that action. Anyway, if you have ever watched George Formby play this on Youtube then you'll notice that he uses different chords. I learned it this way and I guess it just stuck so there's no undoing it now. So, while I'm still going to make a longer video showing off the adorable Kala Pocket Ukulele, I wanted to answer your biggest question first. So, while I could have just told you that it's 16 inches long, it still might be hard to visualize that, right? Well, hopefully that won't be an issue after this video. If it is, I don't want to hear about it ;). In case you were wondering, I rolled a natural 20 with that die. The Rubik's Cube I show you actually has 6 sides (it's a cube, after all) but each face is 4x4. Sorry for any confusion about 4-sided cubes and whatnot. Anyway, here is your size comparison video for the pocket ukulele. Kala’s Pocket Ukulele – How big is it? So, I got my Kala Pocket Ukulele this morning and I haven't been able to put it down for very long. It's so freaking fun! I'm going to make a few videos to show you more about it but I wanted to give you a quick picture to give a sense of scale. People keep asking me, "Just how small is it?". Turns out, they were talking about the ukulele. Hi-yooo! 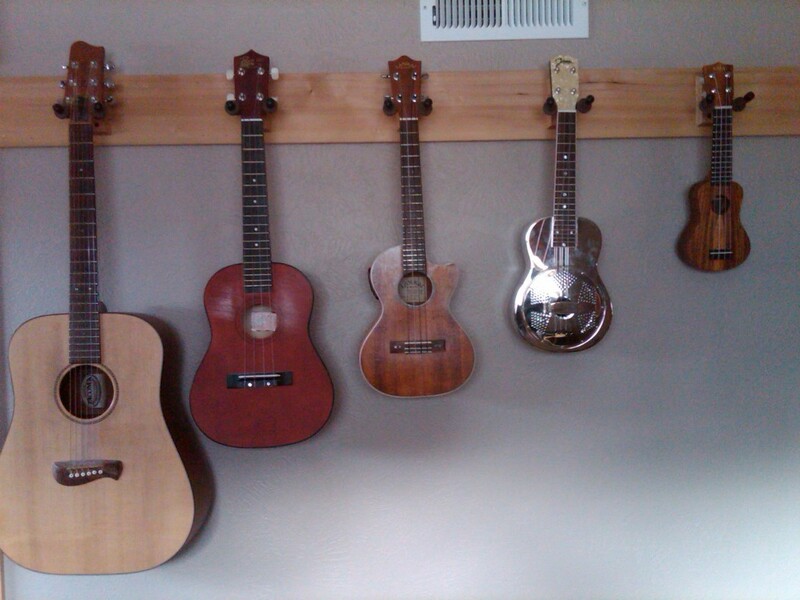 Anyway, here is a picture of my guitar, baritone ukulele, tenor ukulele, soprano ukulele and the kala pocket ukulele. Posted on February 12, 2010 September 30, 2016 Categories Ukulele NewsTags kala, kala pocket ukulele, pocket ukulele3 Comments on Kala’s Pocket Ukulele – How big is it?